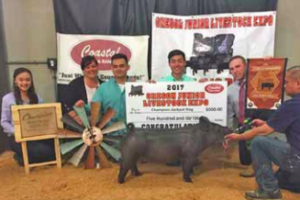 As a firm that feeds out more than our fair share of show pigs, we’ve tried many different kinds of joint supplements over the years. We mostly experienced mixed results and had lots of trouble finding a product we felt was worth the added cost to our feeding program. When we came across Super Joint, we knew this was our product! It provides an incredible value compared to other joint products and we’ve found that feeding a maintenance dose of 1/2 ounce/day has helped contribute to the athleticism of our animals and reduction of joint and soundness problems. We highly recommend Super Joint as our joint supplement of choice! 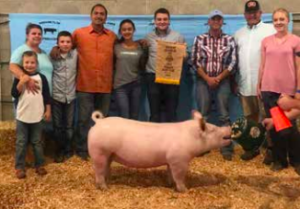 For those show pig enthusiasts that travel to jackpots every weekend or make long trips hauling hogs, we highly recommend incorporating Lung Aid into their feeding program! It is an all-natural product that boosts the immune system and helps prevent sickness during times of stress. 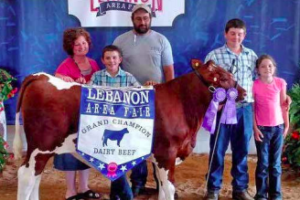 We all know that show day is the last day we want to have health issues, and we’ve found that Lung Aid is a great “insurance” to maintain your project feeling good going into the final drive! We’ve also found that Lung Aid helps promote a faster recovery for animals that are under the weather or dealing with health issues. 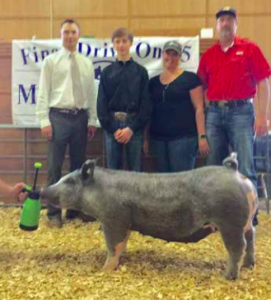 We started feeding U Shield in early 2016 to our show boars and youth projects here at Ottenwalter Show Pigs. We were immediately impressed by their increase in appetite and weight gain after just their first week on the product. We believe U Shield promotes digestive health and a normal stomach ph, and helps eliminate any problems or issues caused by today’s modern high fat diets. 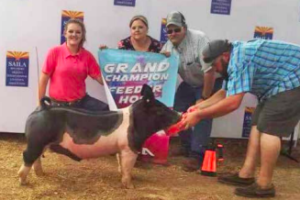 Additionally, we’ve found that U Shield helps keep our hogs on feed during times of travel, stress, and diet change at shows by settling their stomach and helping maintain a calm temperament. 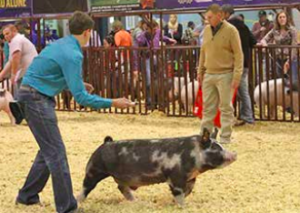 We highly recommend this product for anyone serious about feeding show pigs! Ever since I began using U Shield, appetite has increased and consumption and conversion rates have been incredible. U Shield is a product I truly believe in and will be in my feed program for many years to come. 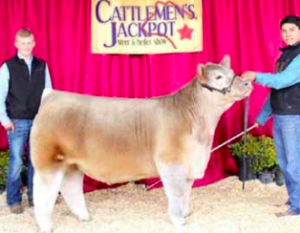 One of our show market steers started coming off his feed. We noticed he had a snotty nose, labored breathing and had incredibly runny stools. We started him on 4 ounces of U Shield directly in his mouth. The next day, he was back on his feed and we continued to do 2 OZ on top of grain morning and night for the next few days. We have since dropped him down to 1 OZ per day, however, he has continued to stay on his feed. He has also gained weight and the hair growth on him has been phenomenal. 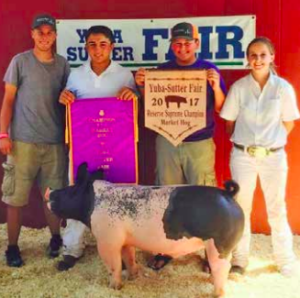 With the results we had with the steer, we started all of our show hogs on it. They had runny stools from switching feed. A few days on the U shield the stools solidified and it made the feed transition much easier on the hogs. 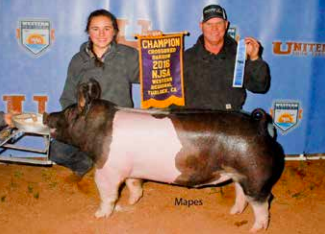 We are incredibly pleased with how Choice of Champions has helped our livestock. When I first started showing my cross, she would get stressed and try and jog the whole time I showed her, so I tried Easy Does it. It totally changed her, she didn’t jog and she drove like a dream! I am a firm believer in it. 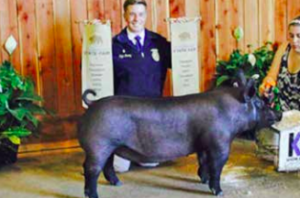 Keaton Havilland’s pig weighed 270 pounds and sold for $25/pound, $6,750. Ever since I have started using U Shield on my hogs, I’ll never take them off of it. My hogs love the taste, it keeps them on feed, and I’ve never had a hog get ulcers. 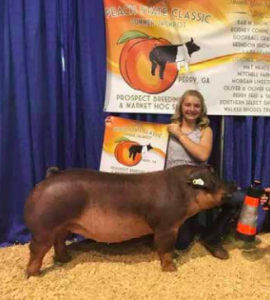 It is a great maintenance product that just keeps my hogs growing and healthy! 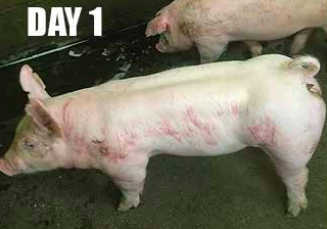 We started using SuperDerm Solution on some sale pigs that had been fighting and had scratches over most of their body. Within five days of applying SuperDerm twice per day, the scratches were nearly 100% gone. We now keep SuperDerm on hand at all times. 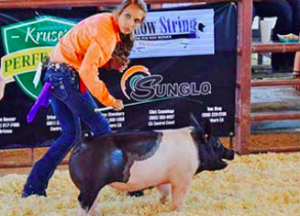 SuperDerm is truly a tremendous product that promotes the fast healing of any skin blemishes your show pig may have! 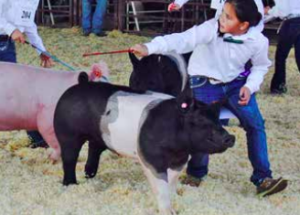 Our gilt went through a bout of illness and never quite bounced back. She had recovered from the illness, but wasn’t acting quite herself and only eating 1/2 her rations - gaining less than 1 pound per day. We suspected tummy troubles so we tried a bunch of tips and tricks including adding things to stimulate appetite: probiotics, and even over the counter ulcer medicine at the advice of the vet. No changes at all. Once we started on U Shield she started eating more and more within 2-3 days. Over the course of 3 weeks she got back up to her full rations of food, and has gained about 150 pounds in about 8 weeks. 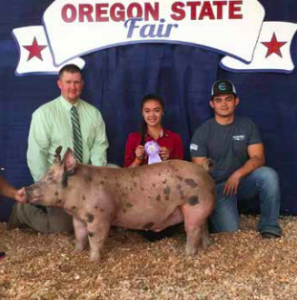 During her last two shows she has won reserve grand champion and grand champion breeding gilt. We now use U Shield on all of our pigs. 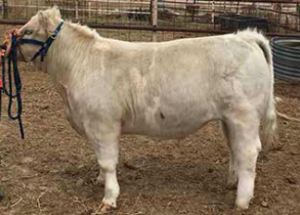 My son’s show steer had been bloating for two weeks and we had changed rations and taken him off of all hay/grass feed and the steer was not getting better. At this point, I decided to try U Shield – giving the recommended dosage to him. Within 3 days he was doing much better and was not bloating after every feeding. The steer has been on U Shield for 15 days, he is gaining weight and his hair shines in the sun now. 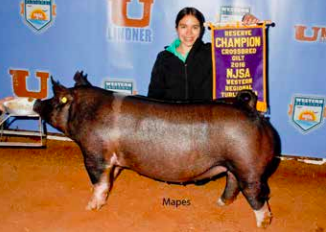 We had pigs off their feed and only gaining 1-2 pounds per week. We gave them ½ ounces twice a day. In the first week they gained over 15 pounds. All of our pigs are given U-Shield daily. 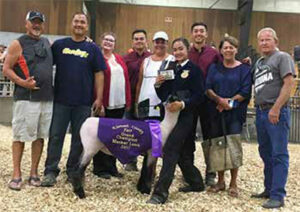 ½ tube (15mls) 2 ½ hours out made our nervous and energetic pigs calm and focused. 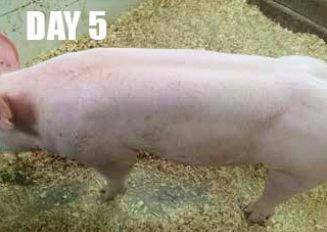 We gave our pig with respiratory problems 1 scoop once a day for 3-4 days and our pig stopped coughing. Now we give 1 scoop 3-4 days prior to a show and we have not had any illnesses. 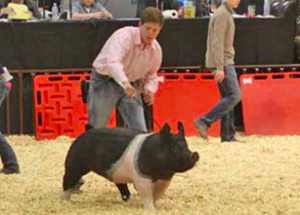 Within a week, our Barrow’s puffy hock showed no signs of soreness or swelling. 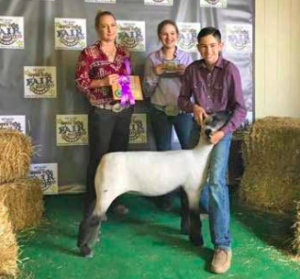 He went on to win all his classes at the State Fair. One of our pigs returned from a show with scratches on his back. On Sunday, we sprayed the affected area and by Wednesday the scratches had disappeared.